The recent total loss of the two $100m tranches of Mariah Re Ltd. catastrophe bonds could make issuing severe thunderstorm only cat bonds more difficult, suggests A.M. Best managing senior financial analyst Asha Attoh-Okine in this article. Mariah Re was the first cat bond which was solely exposed to severe thunderstorms, which includes convective storms and resulting tornadoes, and now with both exhausted A.M. Best are uncertain whether it would be simple to repeat the transactions. The two Mariah Re bonds provided coverage to American Family Mutual Insurance on an annual aggregate basis over three years, with a reset of the aggregate back to zero at the end of each year. The first cat bond issued by Mariah Re provided coverage for aggregate losses above $825m up to an exhaustion point of $925m, the second Mariah Re cat bond covered a layer beneath that attaching at $725m of aggregate losses up to an exhaustion point of $825m. To qualify as an event, a severe thunderstorm must have had an event index value of at least $10m and occur within the risk period. The unfortunate thing for the Mariah Re catastrophe bonds was that the year they were issued happened to be one of the most severe tornado seasons on record, with near record-breaking numbers of tornado touchdowns and amount of losses. 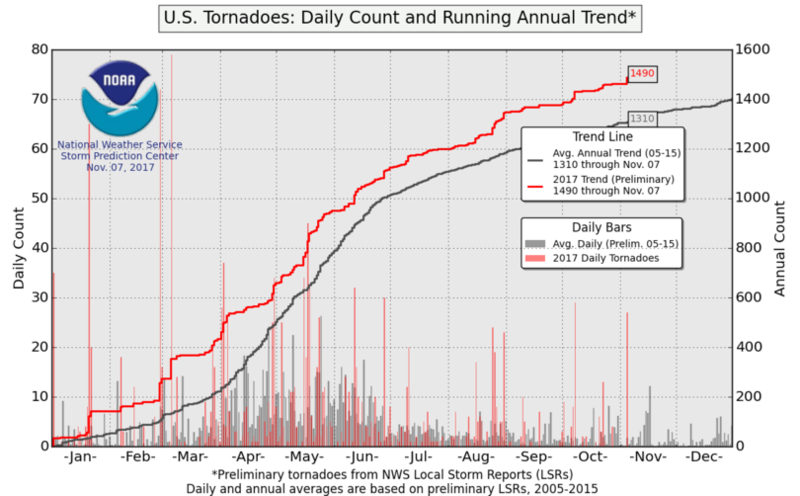 The chart below shows the trend line for the 2011 season for numbers of reported tornadoes versus the annual average. It’s clear to see that 2011 has been a devastating year. In an average season it is unlikely that the Mariah Re cat bonds would have become a total loss. There is a chance that the lower layers $725m attachment point may have been breached but for an average thunderstorm season to cause a complete loss to both cat bonds is highly unlikely. The A.M. Best articles says that if another severe thunderstorm only cat bond comes to market investors would likely expect a higher return to offset a perceived higher risk. Now this is a possible reaction, however most insurance-linked security and cat bond investors are becoming increasingly sophisticated and adept at balancing their portfolio to ensure diversification and that a single loss won’t hit them too badly. For example Swiss ILS investment management firm Plenum Investments said last week that they expected a 2.5% hit to their fund due to the Mariah Re losses, in the grand scheme of investments that isn’t all that large and other investment funds focused on stocks or different types of bonds have seen much, much larger losses of late. So, while investors may expect returns to be at the top end of expectations for a severe thunderstorm cat bond they may well still be happy to take on that risk in future seasons as they won’t be leaving themselves over exposed to a single peril or deal anyway. There are of course other ways to make a future severe thunderstorm cat bond more palatable to investors by adjusting the structure to reduce risk slightly. A repeat Mariah Re deal could, for example, have a higher attachment point (even $100m higher wouldn’t have been a total loss), a higher qualifying event minimum loss ($10m is actually quite low for a per-event minimum), limiting number of qualifying events allowed per day (perhaps only allowing the largest recorded loss event per day to qualify) etc. There are a myriad ways that the cat bond documentation language could be customised to make severe thunderstorm risk more palatable. Of course, the caveat here is that it has to match the sponsors risk profile to actually provide the protection they require. Other possibilities would be to have a parametric trigger of some description for a severe thunderstorm cat bond. That would mean focusing on wind-speeds and so covering the tornado aspect (but perhaps not hail). Another idea might have been to have the deal run over a three-year aggregate loss, so allowing for a severe season in the hope that the next two might be of more average severity and therefore the three-year aggregate not hit the attachment point. Anyway, you get the picture, there are ways that a severe thunderstorm or tornado cat bond could be made more attractive and slightly less risky, if investors want that risk in the market still, our recent discussions with investors suggest they do. A.M. Best also mention in the article that now that American Family Mutual Insurance have exhausted their cat bond cover they will have to go back to the reinsurance market for that part of their program. That’s the expected result of a defaulted cat bond, the sponsor either has to issue another or seek another source of the same cover using the payout from the triggered cat bond. The Mariah Re cat bonds have acted exactly as they were designed to, providing the peak peril cover that American Family Mutual Insurance sought and being triggered by just the type of severe tornado season that they wanted the protection for. Yes, it’s unfortunate that this happened in the first year of the first ever thunderstorm only cat bonds, yes some investors have lost some money, and yes, investors may seek a slightly better return for this risk in future. But no, we don’t feel that this is a negative for the market. If anything, this shows the benefits of cat bond cover for the sponsor and the market working as expected under the terms of a specific deal structure, and we hope that other sponsors will come forward having seen the benefits and seek to issue severe thunderstorm cat bonds structured in a form that the ILS investment community will readily accept. Read more of our coverage on the Mariah Re Ltd. Series 2010-1 and Mariah Re Ltd. Series 2010-2 catastrophe bonds.